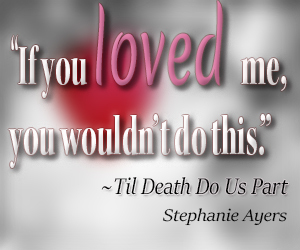 Enjoy this excerpt from my debut stand alone novella, a romantic horror, Til Death Do Us Part. The smell of hot steel filtered in through her vents as the bridge collapsed beneath her. Her trunk slid in the front windshield of the car behind, tossing her head against the seat. Glass sprayed her, some piercing her skin, as she came face to face with the bumper of the truck in front of her. Intense pain filled her even as she lost feeling from the hips down. Her eyes flicked around in agony. Her legs were pinned as the weight of the vehicles above crushed into hers. The bridge trembled again, shaking sideways as if blown by the wind. A small sound escaped as she realized with fading clarity that the vehicles were shifting and releasing some of the weight. The bumper slid to the left and frame of her car lent support to the side of the truck as it turned. Her body was jarred once more and she screamed, but it was drowned out by the sound of groaning steel. Flashes of memory filled her mind—her fifth birthday, her first middle school dance, graduation, and her first true love. His face came into focus before her. His clay-colored eyes surrounded by naturally soft skin; his easy closed lip smile that peeked from between two deep pits on either side of it and one just beneath it; his white doctor’s jacket contrasting sharply with his healthy complexion. She heard his words again, hurting just as much now as they did then. “I can’t make you wait for me. It’s not fair to you or to me. What if I don’t come back?” She remembered the weight of his hands on her shoulders. “What if I contract some fatal illness over there? I could never ask you to take care of me, to burden you in that way. No, it’s better this way.” She remembered the warmth of his palm cupping her chin. “We have no idea what the future will bring us. You know I won’t stand in your way.” She remembered the trail of tears on his face as plainly as if he were standing in front of her now. Her voice bounced against the crushed frame of her car as she pleaded with him. Want more? You can read the whole story right here.